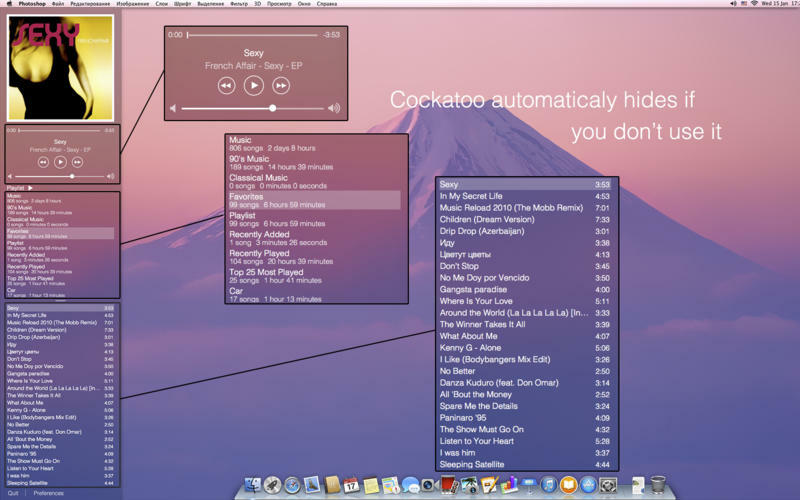 Cockatoo for Mac is an iTunes controller with gorgeous looks and a great interface. Developed by Intuitive Code, Cockatoo takes controlling iTunes and makes it a pleasant experience for anyone who doesn’t favour the already countless ways of doing so. This handy application features design elements pulled from iOS 7 and makes controlling iTunes from your desktop all that much simpler. So if opening up iTunes every time you want to change the track is not your cup of tea, this app is for you! Where Cockatoo for Mac excels, is in its beautiful design and implementation. With a look and feel similar to the flat design of iOS7 and how you swipe it in from either the left or right with your cursor, this app is easy on the eyes. To access the app when it’s running you move your cursor to the side of the screen and out slides the sidebar. This is extremely well executed and feels not dissimilar to using a tablet with multitouch features. 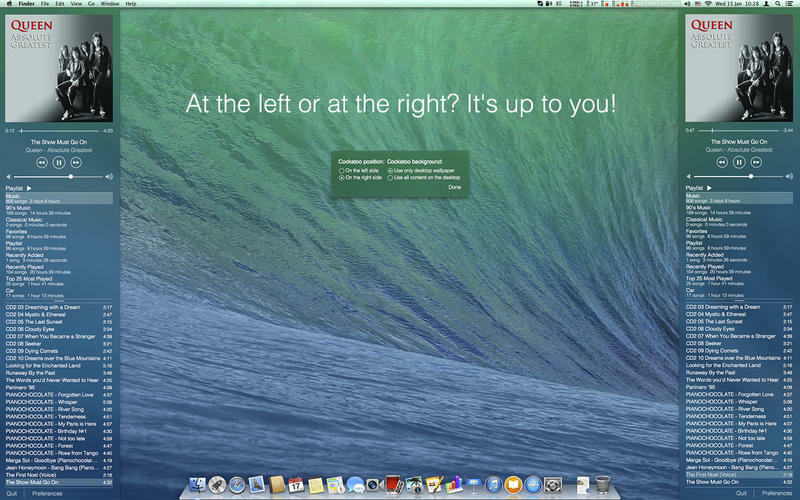 The opacity of the application when it slides in from either side allows it to blend in with whichever gorgeous picture you have selected as your desktop image. Thus it is an absolutely gorgeous app for controlling iTunes. Another great feature is the ability to browse songs and playlists even if iTunes is closed. Then when you have made your selection and hit play iTunes will open, in the background, and play! It’s all too easy. Cockatoo for Mac is one of the more well thought out iTunes controller alternatives we have come across and certainly fits in with the steady increase of iOS7 features making their way into OSX. Perhaps this is a feature Apple will introduce natively down the road.